After much deliberation and countless hours of deciphering the results are finally in for the driver photo contest. Each motor coach driver at Trinity was challenged to capture a unique image with a Trinity Motor Coach during the month of April. Many pictures were submitted. Below are the winners. The grand prize of a digital camera for 1st place goes to Brian Enterkin with his image of the Trinity Coach at Jefferson Memorial. 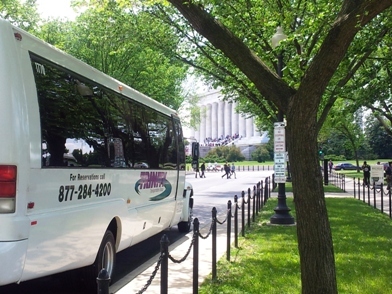 Awarded a $50 fuel card for 2nd place was Jim Bloom of his image in front of the Nations Capitol. 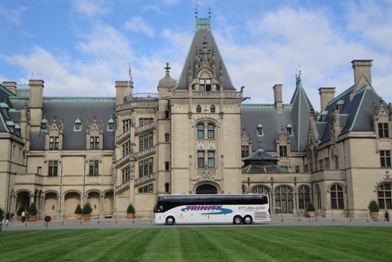 A $20 subway gift card was granted to Phil Haag who took 3rd place for his image outside of the Biltmore Estates in Ashville, North Carolina. Thanks to all the motor coach drivers who submitted photos and for all of the passengers who were apart of the images.